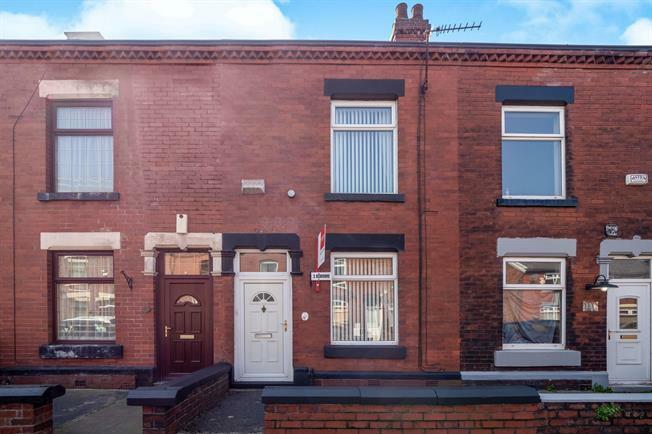 3 Bedroom Terraced House For Sale in Dukinfield for Asking Price £130,000. Double glazed uPVC front door with a double glazed uPVC window facing the front. Radiator, gas fire with surround, laminate flooring, wall lights and ceiling light. Double glazed uPVC window facing the rear. Radiator, laminate flooring, under stair storage and ceiling light. Double glazed uPVC back door opening onto the rear garden with a double glazed uPVC window facing the rear. Laminate flooring, part tiled walls and ceiling light. Fitted wall and base units with complementary roll top work surfaces, stainless steel sink with drainer, integrated electric oven, halogen hob and overhead extractor plus space for a washing machine and fridge freezer. Carpeted flooring, ceiling light and stairs leading to top floor. Double glazed uPVC window facing the rear. Radiator, carpeted flooring, under stair storage and ceiling light. Double glazed uPVC window with frosted glass facing the rear. Heated towel rail, vinyl flooring, tiled walls and ceiling light. WC, panelled bath and a pedestal sink. Double glazed wooden velux window facing the rear. Radiator, carpeted flooring, built-in storage cupboards and wall lights. Gated forecourt to the front with a private and spacious paved garden to the rear.